Matthew McConaughey had a box office success as part of Steven Soderbergh’s Magic Mike, but his other theatrical acting gig this year, Killer Joe, didn’t do as well at the box office, likely due to an unfortunate NC-17 rating given by the MPAA. 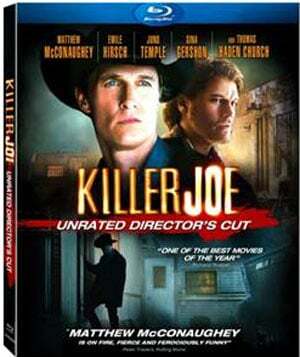 Now, Killer Joe is headed to Blu-ray, DVD, and On Demand on December 21, 2012. So, if you are looking for a violent comedy and thriller for the holidays, you need look no further. Killer Joe will come in an Unrated Director’s cut, which will give audiences the film as director William Friedkin wanted it. If you’re not pushing for the full NC-17 effect, R-rated copies of the film will also be available, but only in DVD format. The flick stars McConaughey as a Dallas detective who moonlights as a hitman. Things get crazy in the Southern story, and if it sounds like something you might be interested in, the good news is that both Blu-ray and DVD sets will come with several bonus features. Killer Joe aired at South By Southwest, and several extras will feature footage from the big event. Additionally, a few extras will be present, including what looks like a making-of segment. Audio commentary will be available with the set, but buyers will have to purchase the Unrated version to get the commentary, which I’m guessing has something to do with Friedkin having no interest in doing two separate commentaries, when there is one version of the film he clearly prefers over the other. You can check out the full list of extras, below.